Mirage Pool on Las Vegas Boulevard is a tropical garden of sorts. Much more than just your average hotel pool, the two pool complex features two Jacuzzi tubs in addition to its two main pools, all surrounded by waterfalls, vibrant colors, and lush landscaping. The venue also has an outdoor café and private cabanas where guests can get VIP service as they lounge in pure luxury. From state-of-the-art lighting and sound systems to the elegant lounge chairs and crystal blue waters, you’ll love your day at the pool. This exclusive Las Vegas Dayclub is designed exclusively for hotel guests. To gain entry, your hotel registration must be verified. Fortunately for non-hotel guests, Bare Pool Lounge, a European-style pool lounge, is open to the public. Only opened during the warmer months, Bare offers a popular party spot with live DJ entertainment, along with two dipping pools, cabanas, and plush daybeds. When arriving to the Mirage Pool, you may notice the retail store that stocks swimsuits, goggles, lotions, and more. For a mere $20, you can rent a raft for the day. For a little more, you can claim reserved seating on one of the lounges, daybeds, or cabanas. The private patios come with a wealth of amenities, including 32” flat screen TVs, MP3 docking stations, safes, Bose Wave radios, pool rafts, mini refrigerators, ceiling fans, artwork, planters, area rugs, misting systems, and more. Guests are also provided with beverages and light refreshments, including fruits, nuts, and pretzels. For the masses, food and drink can be found at the Paradise Café and Dolphin Bar. The eatery serves summer drinks and fare. Grab your grub and head to the pool to enjoy your snack. The pool is heated at a comfortable 78 to 80 degrees year-round. Towel service is provided by the hotel, and chairs and chaises are offered on a first come, first serve basis. 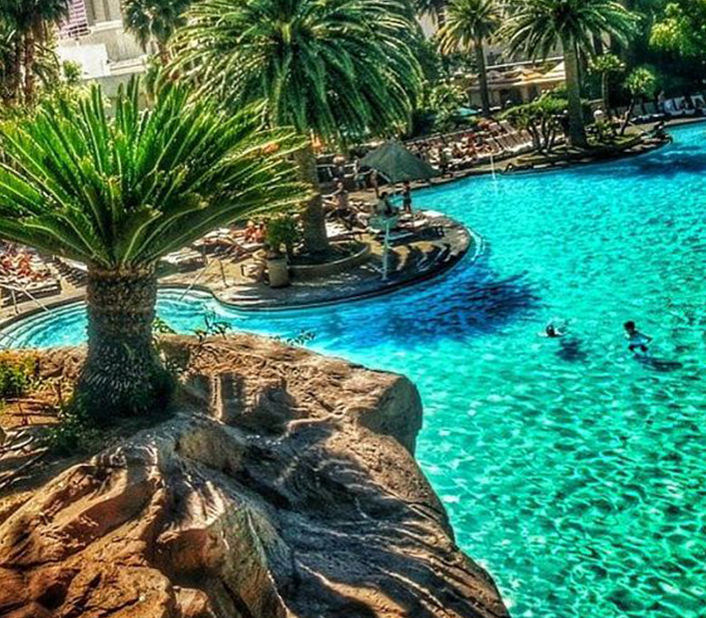 With more than two acres of property, the Mirage Pool is the perfect place to spend the summer. Lifeguards are on duty every day and the pool attendants are friendly and accommodating. Complimentary life jackets are also available for children. With waterfalls and lagoons, this Las Vegas venue has quickly become one of the most popular day clubs on The Strip. The private oasis gives you all of the luxuries of a VIP venue, from the reserved seating to the flavorful tastings of fruit, juice and sorbet. There are a total of 16 private luxury cabanas available for rent. Spend a few hours and unwind in the tropical water environment, savoring tasty dishes and refreshing cocktails. The Mirage Pool can be conveniently accessed through Retail Promenade. The Mirage has one of the most beautiful pools on The Strip, bar none. Enjoy European-style sunbathing, private day beds and cabanas, Jacuzzi tubs, and VIP pampering. While staying in the massive hotel with more than 3,000 rooms, take advantage of the amazing amenities, including the incredible pool complex. The main pool features extended hours during the warmer months of the year, and the small pool and Jacuzzi tubs remain open from 10 AM to 4 PM daily. 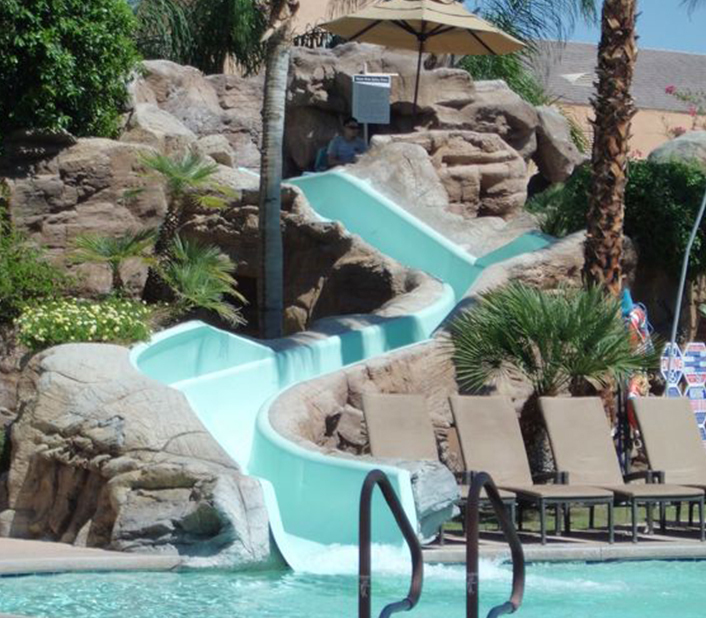 When the main pool is open, guests are welcome to rent inner tubes, rafts, and other pool toys. A trip to the Mirage Pool means a day of relaxation, comfort, and pampering. Besides from the amazing poolside landscaping, lagoons and waterfalls, and expansive atmosphere, guests are able to socialize and just unwind in the exclusive poolside environment. 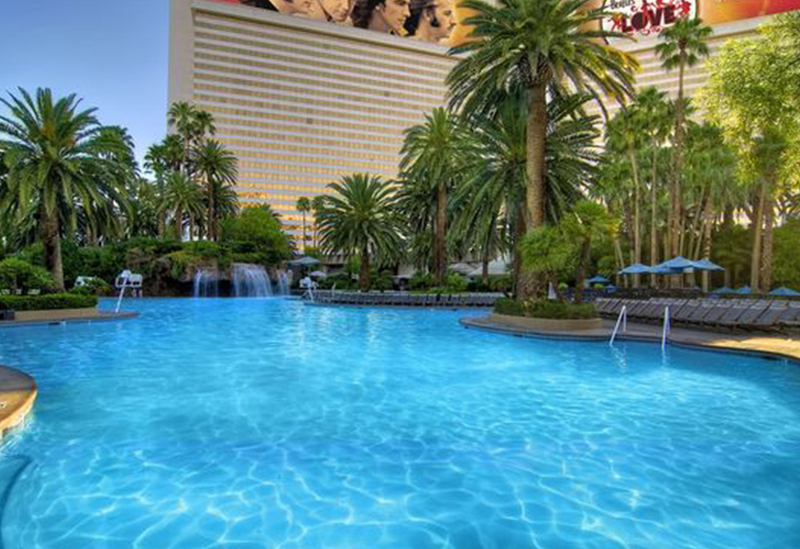 If you’re in the Las Vegas area, take the time to visit the Mirage Pool, located at 3400 S Las Vegas Boulevard, adjacent to Caesar’s Palace and across the Strip from Madam Tussauds.